Geophysical Fluid Dynamics Laboratory/NOAA, Princeton, NJ. How well do we know the historical cyclone record? Observational records of tropical storm and hurricanes are essential in order to discern how climatic changes have influenced tropical storms and hurricanes, and to build predictive understanding of the influence of climate on hurricanes. Here we provide a brief summary of work, in which GFDL scientists have been involved, that aim at assessing and improving our century-scale records of Atlantic tropical cyclones. This website includes access to storm databases with estimates of the influence of observational changes, images and audio files. Recent papers (Vecchi and Knutson 2008; Landsea et al 2010; Vecchi and Knutson 2011.; Villarini et al. 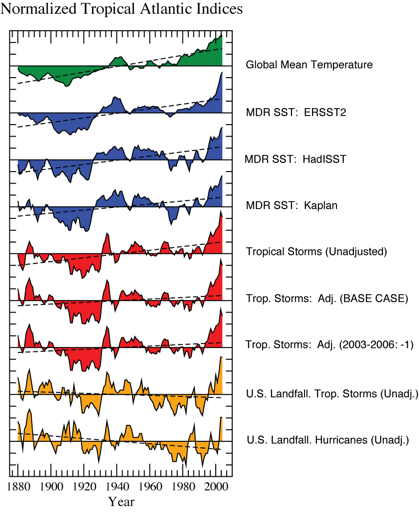 2011) suggest that, based on careful examination of the Atlantic tropical storm database (HURDAT) and on estimates of how many storms were likely missed in the past, it is likely that the increase in Atlantic tropical storm and hurricane frequency in HURDAT since the late-1800s is primarily due to improved monitoring. There has been a very pronounced increase in the number of tropical storms and hurricanes in the Atlantic since the late-1980s. However, to gain insight on the influence of climate change on Atlantic tropical storm and hurricane frequency, we must focus on longer (> 100 yr) records of Atlantic hurricane activity since very strong year-to-year and decade-to-decade variability appears in records of Atlantic tropical cyclones. If greenhouse warming causes a substantial increase in hurricane activity, then the century scale increase in global and tropical Atlantic SSTs since the late 1800s should have been accompanied by a long-term rising trend in measures of Atlantic hurricanes activity. Existing records of past Atlantic tropical storm numbers (1878 to present) in fact do show a pronounced upward trend, correlated with rising SSTs (see Figs. 1 and 9 of Vecchi and Knutson 2008). However, the density of reporting ship traffic over the Atlantic was relatively sparse during the early decades of this record, such that if storms from the modern era (post 1965) had hypothetically occurred during those earlier decades, a substantial number would likely not have been directly observed by the ship-based “observing network of opportunity.” We find that, after adjusting for such an estimated number of missing storms, there is a small nominally positive upward trend in tropical storm occurrence from 1878-2006. But statistical tests reveal that this trend is so small, relative to the variability in the series, that it is not significantly distinguishable from zero (Figure 2). Thus the historical tropical storm count record does not provide compelling evidence for a greenhouse warming induced long-term increase. If we instead consider Atlantic basin hurricanes, rather than all Atlantic tropical storms, the result is similar: the reported numbers of hurricanes were sufficiently high during the 1860s-1880s that again there is no significant positive trend in numbers beginning from that era (Figure 4, black curve, from CCSP 3.3 (2008)). This is without any adjustment for “missing hurricanes”. The evidence for an upward trend is even weaker if we look at U.S. landfalling hurricanes, which even show a slight negative trend beginning from 1900 or from the late 1800s (Figure 3, yellow curves). Hurricane landfalling frequency is much less common than basin-wide occurrence, meaning that the U.S. landfalling hurricane record, while more reliable than the basin-wide record, suffers from degraded signal-to-noise characteristics for assessing trends. NOAA/GFDL audio research conversation podcast with Tom Knutson and Gabriel Vecchi on historical changes to Atlantic tropical storm frequency and the impact of storm duration. This podcast arises from the August 2009 Landsea et al (2009) J. Climate manuscript. 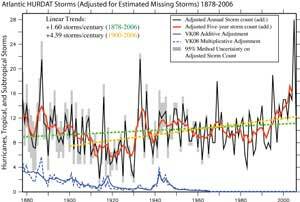 1878-2006 North Atlantic tropical storm counts corrected for “missing storms”. Based on Vecchi and Knuston (2008).ASCII Text File. NOAA News Item on the publication of Landsea, Vecchi, Bengtsson and Knutson (2009, J. Climate).